Goplus Folding Sit Up Bench Adjustable AB Incline Flat Weight Bench by Goplus at Strongman Pictures. MPN: SU-34827-PS. Hurry! Limited time offer. Offer valid only while supplies last. 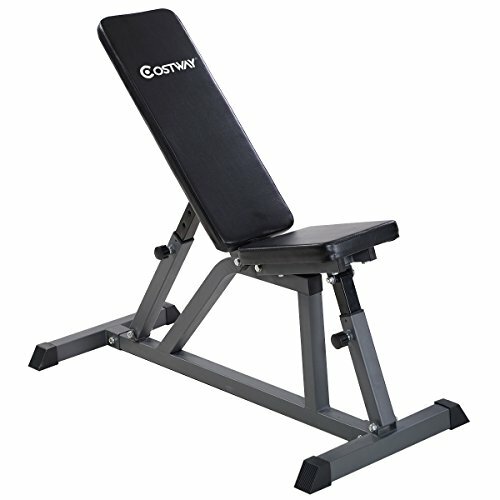 DescriptionThis Is Our New Incline Sit Up Bench, Which Makes Work More Effective, As Well As Adds Strength And Tone To The Entire Abdominal Section. Heavy-Duty Construction - This exercise bench features heavy-duty framework that's guaranteed to withstand a weight of 440 lbs. Comfortable Performance - The premium padding and upholstery provide adequate support to the body for comfortable reclining and sitting, give you a comfortable workout experience.. Height Adjustable - With an adjustable back pad and seat that allows you to get different levels of exercise, meet people's variety of sports needs. Easy to Store - With foldable performance and compact design feature that can be easily stored anywhere. Ergonomic Design - This workout bench showcases an ergonomically designed structure that helps you exercise properly and efficiently.